An extended gap on a résumé can be a major red flag on a job application. It can be difficult for those who have been incarcerated for any length of time to present themselves on paper and to be competitive in a job search, even long after serving a sentence. WorkSource Spokane’s three-day Jumpstart to Employment program helps transition ex-offenders back into the labor market with classes on how to write and target résumés, search for jobs, and avoid having job applications automatically screened out. The Spokane City Council and Spokane Board of County Commissioners each recently approved policy changes to hiring processes that will impact individuals with criminal records applying for jobs within the City of Spokane and at Spokane County. This follows similar actions in a number of communities around the nation that are seeking to facilitate the transition of ex-offenders into gainful employment and contribute to reducing recidivism rates. The Workforce Innovation & Opportunity Act specifically requires outreach and services to ex-offenders, and our local workforce system will partner with the City and County to develop strategies that align our work and effectively assist in connecting this population to resources that lead to employment. The process of reintegrating into society after being released from prison can be very challenging. Many people face barriers including housing and employment. Pioneer Human Services is a statewide organization that helps those with criminal histories, substance abuse disorders, and mental health issues become healthy and productive members of the community through treatment, housing, and employment training. 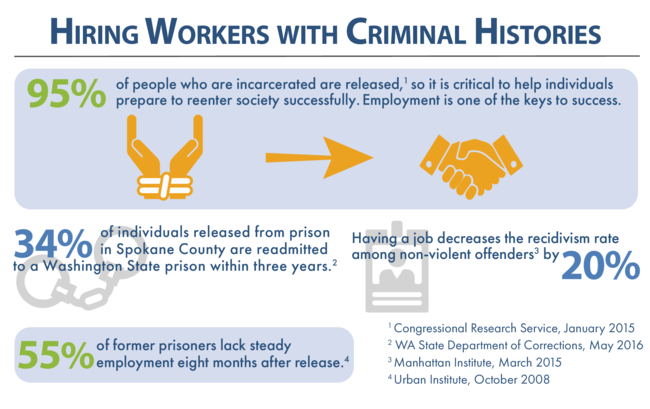 In Spokane, 41% of Pioneer’s own workforce are people with criminal backgrounds. “They are some of our best employees because they appreciate someone giving them a chance. In a time when reliable employees can be hard to come by and turnover is a challenge for all employers, these folks are some of the most loyal and committed you will find,” said Dan Sigler, Spokane Regional Director of Pioneer Human Services. Pioneer recently transitioned their services at the Carlyle Center in downtown Spokane to operate as housing for those with criminal histories, and they now have nine programs in the Spokane area. In 2016, Pioneer provided services to about 2,000 individuals in Spokane, 70 percent of which had criminal histories. For more information about Pioneer Human Services, please contact Dan Sigler, Spokane Regional Director: Dan.Sigler@p-h-s.com.